Why is décor an important part of your event? If you are throwing a party, you always want your guests to have a good time. However in order for that to happen, we have to make sure we utilize all of our guests’ senses. We “feast” with our eyes first. Decorating things in a particular way can help evoke feelings to better enhance our guests’ experience. Using certain colors, arranging furniture a certain way, using textured fabrics, dramatic lighting, candlelight – these are a few things that can really make or break a great event design. When Ed sits down to start discussing our clients design needs for an event, he asks them how they want it to FEEL. Our clients may use the words cozy, intimate, inviting, romantic – these are great adjectives to describe how something feels. So how can this translate into a design? Create small furniture vignettes for your guests’ to sit around during the cocktail hour with lots of low, soft candlelight and flowers. This is an inviting, cozy feeling that inspires conversation. When you start bringing in the other senses: sound (good music) and smell (delicious food) you have now have the makings for a memorable event. People are going to remember how the event looked and the yummy food they ate, but they will also remember the great time that they had, and that feeling is happy. Mission accomplished. This is a great example of using your senses to design a space. This is the Terrace Room in the famous Plaza Hotel. Our client wanted to use this space to for the ceremony. They wanted a romantic, cozy feeling that gave a nod to the great outdoors. Ed used every aspect of the room as well as the equipment that was used to do the installation. He used the staging truss to make large trees to create the Chuppa, he hung chandeliers 8 inches of the floor with soft lighting, the bride walked down a mirrored aisle and there was candle light that surrounded the room. 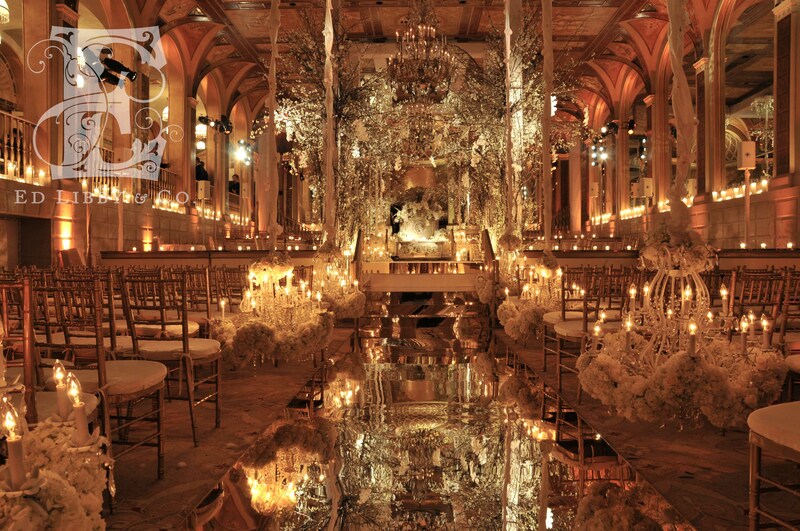 The mirrored aisle reflected all of the warm light that was in the room giving that warm, cozy intimate feeling. Wow!!!!!! So romantic and delicate…congratulations!